Thankfully there was a volunteer at the shelter with a special place in her heart for shepherds. When Anna saw Bruno she was was horrified by his condition and immediately reached out to fellow animal rescuer and friend, Pam, for help. From there they began the process of saving Bruno. When Bruno was released from animal services on Sunday, August 5th, 2012, he was burning up with fever, his gums were very pale and he was barely able to stand, let alone walk. He was rushed to the vet where he would spend the next two weeks under continuous observation and care. Once Bruno was finally strong enough to be released Pam took him “home” to meet his new foster family and begin his road to recovery. Initially, Bruno had weekly vet visits to monitor his blood levels, organ function, etc. He had serious thyroid issues and his deteriorated immune system allowed severe mange to take over his entire body. After a great deal of care, slowly but surely the open sores began to heal, his coat began to fill in, and he started to gain weight. However, his huge paws remained a concern and despite various treatments they were just not healing. In fact, they were getting worse and it was clear his feet were causing him a great deal of pain. A culture and sensitivity test revealed Bruno was suffering from two strains of MRSA. After several months of extensive treatment for MRSA, it seemed Bruno’s paws were finally beginning to heal and once he was well enough to begin to go on walks a whole new world opened for him. He was finally able to join the rest of his new family on vacations and after Bruno’s first camping trip, he seemed to have a new sparkle in his eyes and an even brighter spirit! Bruno loves to go for walks and car rides, bark at squirrels, play in the hose, and he’ll fetch a squeaky toy as many times as you throw it. He has a very gentle and loving disposition and is loved by everyone he meets. Curious of Bruno’s past, we turned to the internet for more information. As it turns out, Bruno’s Dad was a disabled Vietnam veteran confined to a wheel chair and Bruno was his pride and joy. Sadly, in July, 2012 Bruno’s dad was admitted to the VA hospital where he passed away. 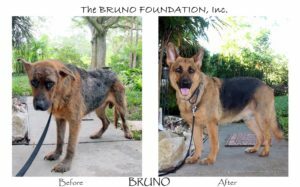 Unfortunately, by the time Bruno was discovered, it had been almost a month that Bruno was left alone in his home and the lack of food, water, medicine and basic care, coupled with the emotional distress of losing his dad had taken an extreme toll on Bruno. We learned that Bruno was taken to Pasco County Animal Services and put in the back Building C, with no air conditioning in Florida’s August heat. As in the case of so many animals, if it weren’t for someone caring enough to speak up for Bruno, he (we) would not be here today. The Bruno Foundation, Inc. was created to raise awareness in the community and inspire others to make a difference. As a 501(c)(3) non-profit organization, The Bruno Foundation relies solely on donations to support our mission. We promote events designed to raise awareness in the community and believe in educating others on the plight of animals. Sadly, there is a huge disconnect between animals in need of rescue and the general public, our hope is to help bridge that gap. Please join us… Together we can make a difference!